Kawena Mechler has been a hula dancer her whole life. Born and raised in Hawaii on the island of 'O'ahu, her life has been shaped by Hawaiian music, hula and culture. 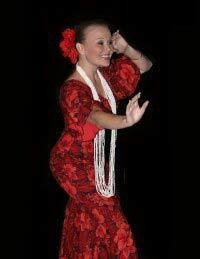 She has been a featured dancer for Tony C. (Conjugacion), Weldon Kekauoha, Sean Na'auao, The Ka'ala Boys, The Kaimana Band, Kamaka Fernandez, Pali, The Brown Boys and Sam Kapu III, and has danced for many of the top Hawaiian artists including Robert Cazimero, Keale, Brother Noland, Ledward Ka'apana, 3 Scoops of Aloha, Ocean Kaowili, and many more. She first competed in the Merrie Monarch Hula Festival in 1999 under the direction of her Kumu Hula Ellen Castillo and returned in 2003, 2007, 2008, and 2009. She conducts workshops in Japan , and was part of the performance troupe that accompanied the Governor during a visit to China to promote HawaiÔi as a visitor destination. She is a composer of mele, contributing her lyrics in the Hawaiian language on songs. In 2009, she co-founded the company HulaBaby Hawaii, a high quality hula accessory line that combines realistic flowers and Swarovski crystals. Contact Kahiapo Talent for more information on private and group lessons.